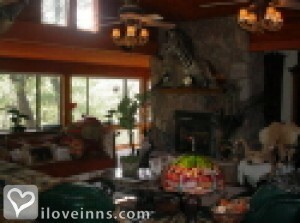 Payson bed and breakfast travel guide for romantic, historic and adventure b&b's. Browse through the iLoveInns.com database of Payson, Arizona bed and breakfasts and country inns to find detailed listings that include room rates, special deals and area activities. You can click on the 'check rates and availability' button to contact the innkeeper. With its location, it is only right for Payson residents to call their town the Heart of Arizona. Despite its small land area, Payson is fortunate to have a number of interesting sites to visit. Tonto Natural Bridge State Park, with its spectacular geological formations, is just one of these. Much nearer to the center of Payson is Rim Country Museum. This museum provides visitors with a quick yet comprehensive glance at historical and natural wonders of the town. The town is also famous for its rodeo events. In fact the oldest rodeo was held here. Visitors will not have a hard time looking for accommodations due to the presence of a number of Payson bed and breakfast inns. By Verde River Rock House Bed and Breakfast. Payson is a town located in Gila County, which is part of the state of Arizona. For being in a location considered to be at the center of the state, Payson is often called the "heart of Arizona." However, its location is not the only thing that the locals are most proud. The town also offers some attractive destinations, which make tourists come and check in at Payson bed and breakfast inns. Just a few miles from the town center, tourists can find themselves having fun at the Tonto Natural Bridge State Park. In the nearby Green Valley Park, just a mile from the center of Payson, is the Rim Country Museum, a gallery that provides visitors with a glimpse of the history of Payson. For tourists who would rather be in the outdoors, Tonto Ranch should be the destination. By Verde River Rock House Bed and Breakfast.